If your movie puts six teens on a boat in the middle of a lake and strands them while a massive, carnivorous fish circles them in the water, its fair to suggest that viewers would expect said flesh-eating fish to feast on the teenagers and do so in gruesome fashion. Why else do people watch movies about teenagers and bloodthirsty water creatures? 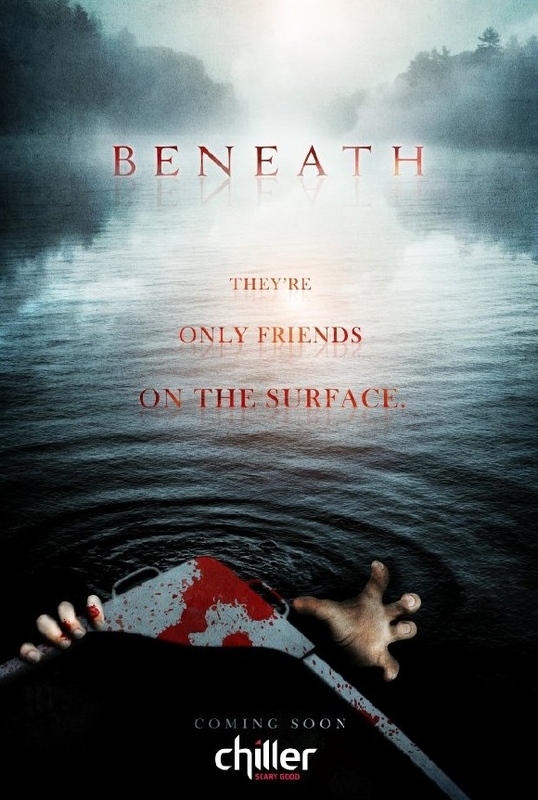 For some inexplicable reason, Beneath, a new Chiller original movie, packs shockingly little man-eating fish carnage into its 90 minutes. There is a grand total of one decent fish kill; there are far more instances of people yelling at the fish than there are of the fish dining on people. The familiar but workable setup features a group of recent high school graduates planning a day of partying in the woods. To get to their party spot, they need to cross Black Lake. They hop in a rowboat and start their journey. Halfway across the lake, a few of them want to swim, so they stop. Johnny (Daniel Zovatto) knows that something is in the lake. He pleads with the group and insists they need to cross in a hurry, but they dont listen. Before long it is clear that there is something in the lake, something big. Everyone makes it back to the boat, but the giant fish manages to severe an artery in someones arm. They quickly bleed to death, and everyone panics. The oars are used to try and attack the fish, and those too are gone quickly. The bickering and panic are immediate, and the rest of the group decides to start voting people off the boat to serve as a distraction while the others try to get to shore. Rather than devote time to fish attacks, the bulk of Beneath focuses on the group shouting and fighting and the fish swimming around the boat. This grows tedious in a hurry. The teens range from annoying to truly detestable, meaning we are rooting for the fish to eat them, making it extremely disappointing when it doesnt. The worst of the bunch is a wannabe filmmaker who films the first victim as they bleed to death and later exclaims I might make films that change the world when arguing why he shouldnt be used as a distraction. In addition to being annoying and detestable, these people are not bright. Not once do they ever yell for help. They also try to beat the fish with an oar even though it has already destroyed the only other one they have. It also appears that when they desperately paddle after using someone as a distraction, they go in the direction that is farthest away from shore. That talented filmmaker Larry Fessenden directed Beneath makes it all the more of a letdown. While it thankfully is not CG, the fish itself looks pretty silly. Its origin is never explained and Johnny, while clearly knowing about it, doesnt ever say how he knows of its existence. With plenty of bad dialogue (I will not let that thing control me!), unappealing characters, and a lack of killer fish carnage, theres really not much to see here.